Visit the Kawazu-zakura Cherry Blossom Festival in Shizuoka Prefecture which is famous for being the earliest blooming sakura on the Japanese mainland. There are about 800 trees along the river bank with its beautiful deep-pink petals. The tour also includes strawberry picking (all-you-can-eat) in Nakaizu and lunch in the picturesque location of Joren Falls. Note: This tour is seasonal and runs from February to March. Depending on the weather and the cherry blossoms, the dates are subject to change. Join the tour at Shinjuku Washington Hotel at 7:20am where the coach will whisk you away for a fun-filled day in Shizuoka. The first destination is Nakaizu for a spot of strawberry picking and eating as much as you can for half an hour. Don't eat too much though as you will not want to spoil your appetite for lunch which coincides with a visit to the beautiful Joren Falls in Izu. Located in Yugashima, this waterfall is included as one of the top 100 scenic waterfalls in Japan. Lunch is a beef sukiyaki set meal or a seafood and mushroom hotpot if you cannot eat beef. Board the bus bus again after an hour or so heading to the main event of the tour: The Kawazu Cherry Blossom Festival. 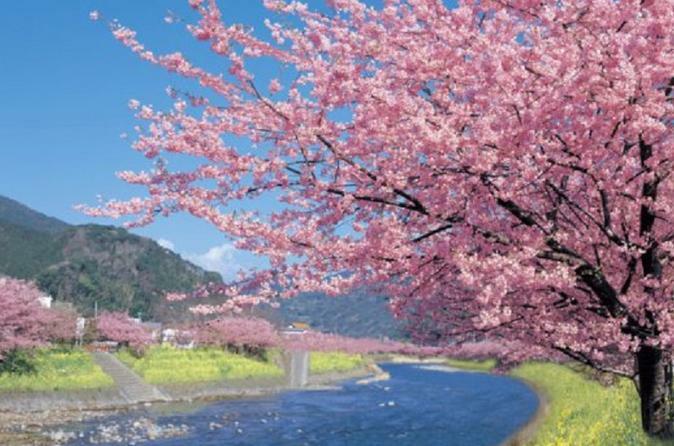 You will have a chance to catch the Kawazu cherry blossoms, the earliest blooming cherry trees on the Japanese mainland (the season usually runs from mid-February to early March.) Admire the deep pink petals of the 800 cherry trees that mostly line along the Kawazu river which are so popular among Japanese tourists. With a carpet of yellow canola flowers among the cherry trees, a picture postcard view can be had. Enjoy the cherry blossoms for around an hour and a half before the bus takes you back to Shinjuku.